Today while tryng to do a V2V migration form Parallels to VMWare, I had the need to boot my current VM into BartPE so I could create an image with Tru Image. When the VM started up, I tried to press al sorts of F key combos to get to the BIOS screen. In Virtual Server/Virtual PC, pressing F2 does the trick; but in Parallels it was not working. Sounds easy? Well, usually it is - but today I faced a problem with step 3 above. When I mounted the VHD and formatted it, everything seemed fine, but when TrueImage tried to read the VHDs, it barfed and said that it was "unsupported". This was very weird since I mounted the VHDs time and time again without problems and the contents were inside. The VHDs were formatted as NTFS, so there really was no reason for the "unsupported" file format. We tested and decided to format the partitions from within TrueImage using the new hardware wizard. After formatting them, I mounted the one that would hold the TrueImage image, copied the file and then tried to restore the image once again. To my surprise, this time around TrueImage read both drives and the image contained on the VHD that I just copied. After that, it was just a matter of specifying the source and target and the P2V migration was underway. Bottom line, if you are planning on using empty VHDs with TrueImage (the bootable CD), make sure that you format the VHD with the utility itself and not within Windows using vhdmount. Why? Dunno, but if someone would like to shed some light on this issue, please be my guest! During the last month, due to some testing we had to carry out with a software project, I needed to work with 64-bit virtual machines. Virtual Server does not support 64-bit virtual machines, so I downloaded a copy of VMWare's free server solution and decided to give it a try. After playing around with VMWare Server, I've had my ups and downs which I will try to contrast with my previous experiences with Virtual Server. Both are free, no contest there. VMWare requires a registration process to obtain the product key for the server, which can be a bit of a hassle. Virtual Server requires a registration process as well but no product key is needed. VMWare's server runs as a 32-bit process on 64-bit hosts and offers support for 64-bit VMs (read again, slowly and it will make sense). Virtual Server runs as a 64-bit process on 64-bit hosts and does not offer support for 32-bit VMs. VMWare offers virtual drives that expand as they become bigger or ones that are of fixed size. It does not offer what is known as Difference Disks in Virtual Server. These disks are amazing when working with lab environments or for multiple restore points, and is one feature I cannot believe is in some way or another on VMWare. VMware and Virtual Server both have this option. The restore process under VMWare is easier to carry out than on Virtual Server. VMWare Virtual Server imports Virtual Servers vhds seamlessly. It does, however, convert them to a big mess of chunks that is hard to maintain. Although Virtual Server does not import any other type of virtual hard drive from another reseller, there are tools out there that will do the job for you. Even though there are some clear advantages of having a web interface for Virtual Server, there should have been a binary to administer it. There are some new alternatives out there that might work for Virtual Server, but the bottom line is that the 32-bit client for controlling VMWare's server blows any web application out of the water. Overall, both are excellent products and the fact that they are free is amazing. I have grown so used to Virtual Server that I will continue to use it unless I have the specific need for a 64-bit VM, and when that time comes, I will hopefully be able to use Longhorn Virtualization. Importing a VM from another Product? Uninstall the Additions! VMWare, VirtualPC, Virtual Server, Parallels - they all have one thing in common: in order to work faster, they install a set of drivers that patch the VM. This has a very positive effect on the virtual experience, but what happens when, say - the VMWare drivers are running under Virtual Server? As you might have guessed it, no good things happen. Products such as Parallels and VMWare Virtual Server allow you to import machines that were created with Microsoft's virtualization products. If you grab a machine from Microsoft's VHD test drive program and import it right away, you are in for a nasty surprise. The drivers for the previous product are still there, and they *will* conflict when you install the additions of the new product. So remember, get rid of your product's "additions" *before* migrating virtual machines. On a previous post I was having problems with the VMRC ActiveX control when creating an instance at runtime. The problem boiled down in having an invalid OCX state exception thrown at me whenever I tried to access a property of the VMRC ActiveX control at runtime. After researching for quite a while on the Internet, it struck me that if I just placed the VMRC ActiveX in a UserControl at Design time, and instantiated that UserControl instead of the ActiveX directly, things would work great. I implemented this into the VMCA application and it worked perfectly fine. You can see I managed to get VMRC connections to different machines in different tabs at runtime on this post. Some people have asked where they can get a copy of the VMCA. Unfortunately as of now, the application hasn't been thoroughly tested and is missing some functionality which I deem as basic. Also, this is something I have been working on my spare time and lately I have been swamped with other projects. Perhaps the best approach would be to take it to stable phase and then try and get it on CodePlex so that everyone can pitch in...we'll see how that goes. For all things related to software migration, be sure to visit Artinsoft's website. For training in Visual Basic to C# migrations, Visual Basic to VB.Net, Virtualization, and 64-bit training check our training web page. The application has undergone major revisions under the hood. I have tried to separate tasks into different classes in order to gain modularity. So far I have a VMManager, a VHDManager, a VMRCManager and so on. Reading the code now makes a lot more sense than before. From here, you can pretty much do anything related with VHDs. After modifying some ISOs, I have also managed to completely automate the defragmentation-precompaction-compaction phase required to reduce the size of VHDs. Now I just leave the process running and when I arrive the next day, my VHDs are like 50% smaller. I had not touched C# in a while, and all I can say is "Wow". C# rocks, it is very intuitive and creating efficient GUIs is a bliss. One can only wish that there was a 2.0 framework to run under OS X. *sigh*...It has been impossible to embed the video here, here is the youtube link. In case the resolution of the movie above is too small, the avi can also be downloaded. During the Virtualization labs, which are freely available to anyone interested in Virtualization, the Artinsoft trainers have had a chance to teach the Virtual Server COM API and its uses. One of the attendees showcases the application that they build on his blog. I think the application in its finished state is a great start to create something functional, but it is in no way something that can be used for management right out of the box. The reason for this is simple: we wanted simple in order to reduce the learning curve of the COM API. Sounds easy, huh? Well, that is what I thought. 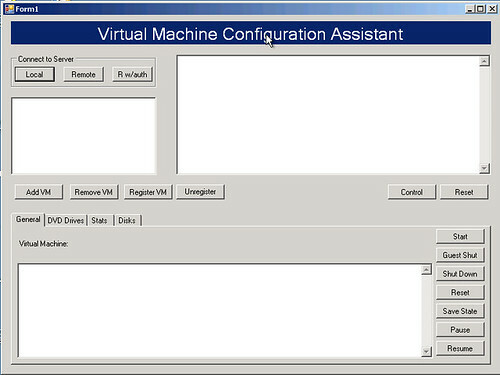 I have in my application the reference to the VMRC ActiveX control, the image that you see above depicts a VMRC instance placed on the form in Design Time. The problems seems to be that at design time, the VS Designer creates and configures a resource that is used to keep track of the ActiveX instance's state. At runtime, this resource does not exists and that is the reason why the ActiveX is an invalid state. Not being the ActiveX hacker that I would like to be, I am baffled on this problem. In order to repro, just debug the app, and from the menus select Remote Control...if you can somehow make it through without the invalid OCX state exception, you are right on the money. Longhorn Server will have a virtualization role that will basically replace the need to use Virtual Server when working with Longhorn. If you want to play around with the new virtualization role as of now, it is not going to be possible because this feature not present in any public betas. These videos introduce virtualization technology and point out the differences between sofware and hardware based virtualization. They explore existing and emerging usage models of Virtualization: Server consolidation, disaster recovery, development/testing, load balancing, fast provisioning, etc They introduce the next generation of Intel� Virtualization Technology (Intel� VT) and VT -d (Directed I/O) and suggest usage models for the future enterprise. At this point, Parallels is one of the key players when it comes to virtualizing any x86 operating system on OS X. I use it on daily basis and cannot live without it. For a simple .NET application like this, would we need different applications when running on 64 vs. 32 bit hosts? Before answering, please allow me to elaborate more on where the question is going. 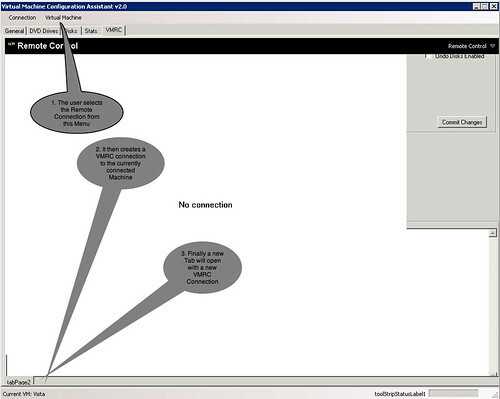 Virtual Server has a COM API that allows it to be managed by applications and scripts. Virtual Server R2 SP1 Beta 2 (phew) comes in two flavors: 32-bit and 64-bit. The owner of the question wondered if you could manipulate a 64-bit instance of Virtual Server using a 32-bit application (or vice-versa). Ok, now that the question is (hopefully) a bit clearer, the answer to the question is no, you do not need to have a different version for accessing Virtual Server from an application regardless of its bit-architecture. Why? Virtual Server's COM API is accessed by an out-of-process COM library, which means that everything is done by means of RPC. When two applications are communicating with each other by means of RPC, the 1st commandment of 64-bit is not broken (thou shall not run 32-bit and 64-bit code within the same process space).